Click on the image above to view Andres Goyanes’ business card. Our Founder’s experience covers the full spectrum of marketing competencies, including advertising, public relations, branding, copywriting, and creative services. Andres Goyanes, MBA is a business professional with over 20 years of experience managing the full spectrum of corporate marketing competencies, including advertising, public relations, branding, copywriting, and creative services. He is passionate about communicating value, performance, and quality on behalf of his agency’s clients. Having worked in the capacities of Marketing Manager, Marketing Director and Chief Marketing Officer at a number of companies, Andres has remained focused on practicing Integrated Marketing Communications as the guiding philosophy for his business practice. 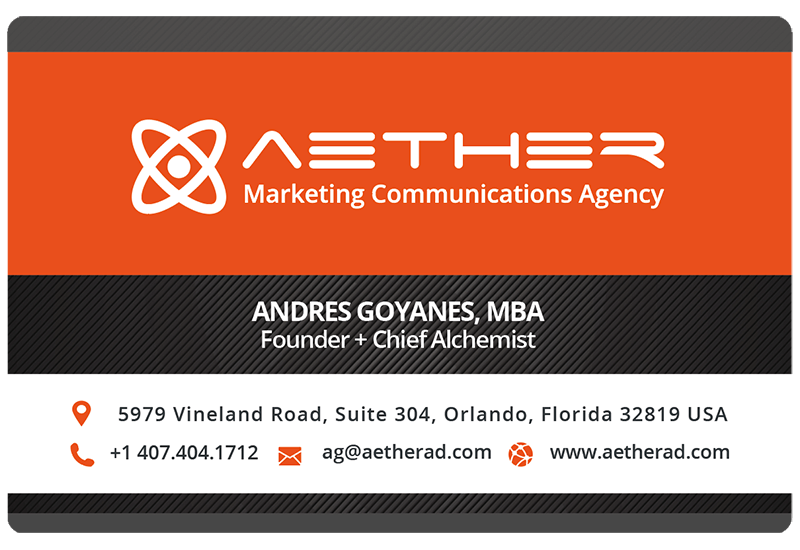 When he made the decision to launch AETHER, Andres became aware of the need for companies to fill the void of having limited or no in-house marketing expertise to guide and execute projects. And that’s when he decided to start a marketing agency of his own. I’m passionate about communicating value, performance and quality on behalf of our clients, always applying the latest marketing philosophies and methodologies for their benefit. Andres holds a BS in Marketing from the University of Central Florida and an MBA with a concentration in Sustainable Business and Green Development from Marylhurst University. He is a graduate of Leadership Orlando Class 66 and a Past President of the American Marketing Association of Central Florida. Andres has also been an Adjunct Professor of Marketing at the University of Phoenix, Central Florida Campus, since 2013. 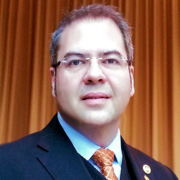 Active in Rotary since 2009, Andres Goyanes serves as Assistant Governor for Rotary District 6980 in Central Florida. He is also a Paul Harris Fellow and was the Founding President of the Rotary Club of International Drive. In addition, Andres is an Ambassador for ShelterBox, a disaster relief organization that provides shelter for families displaced by natural disasters and humanitarian crises around the world.